The most valuable basketball cards in the hobby can easily fetch upper five and six figure price levels. 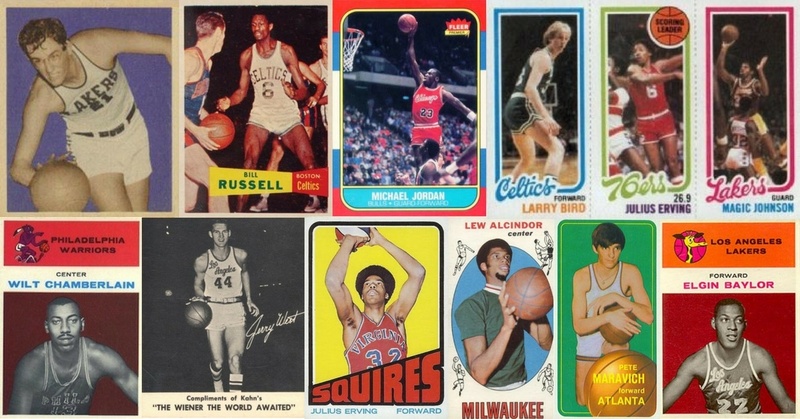 To build this list, we relied on PSA’s Sports Market Report online price guide to include any basketball card estimated to fetch more than $3,000 on the open market. So you won’t see any Lebron James, Kobe Bryant or Steph Curry cards on here even though those can be extremely valuable, too. Here's the complete list of the fifty-two most expensive basketball cards. Each short summary gives a brief explanation of the history of the card, what makes it worth so much money, and is accompanied by a look at the card itself. George Mikan’s 1948 Bowman rookie card tops our list as the “Holy Grail” of all basketball cards. The legendary center was the game’s first unstoppable big man and set the bar for other big men like Wilt Chamberlain and Bill Russell who would soon follow. The imagery of the card is unforgettable as it features a hard-charging Mikan atop a deep blue background. Centering and edge toning are common challenges with this card. And it’s also interesting to note that you may run across some hand-cut specimens after several uncut sheets of 1948 Bowmans surfaced a while ago. The 1957 Topps basketball set is one of the most important yet toughest in the hobby–and Bill Russell’s rookie card is the key card to own. Poor centering and low quality printing make it difficult to find the card in high grade. The card is a short-print, too, which makes it even more scarce from the beginning. Russell is one of the most successful and dominant big men the game has ever seen so collectors go crazy for this card. Topps tried something new with its 1980-81 set, offering cards that featured three different players on perforated mini cards. By far the most sought after is the rookie card of Larry Bird and Magic Johnson with Julius Erving sandwiched in between. All three players appear on other cars in the set but this one is the key. Originally the set wasn’t too popular with collectors but that has changed drastically in recent years. Today, this card is one of the most popular and sought after of any basketball card. The NBA’s all-time leading scorer made his mainstream basketball card debut in the 1969 Topps set. Much larger than typical sports cards, his rookie card measures roughly 2 ½” by 4 11/16″. Although that design decision was creative, it makes the cards more susceptible to surface wear and tear. Centering and print defects are also challenges so high grade copies of Kareem Abdul-Jabbar rookie cards can fetch big dollars at auction. It can be argued that Chamberlain was the game’s most dominant player to ever set foot on the hard wood. And Wilt’s 1961 Fleer rookie card sits atop many others on this list from the iconic set. Fleer broke the card fronts into three sections with team logo and name at the top, player name and position in the middle, and a large image of the player at the bottom. Hobbyists put this card among the keys on their wishlists and values have continued to soar in recent years. One of the more unusual cards on this list is Michael Jordan’s 1985 Prism Jewel Sticker issue. The hologram of Jordan going up for a reverse dunk put this card ahead of its time in terms of design standards. They weren’t widely distributed and were often sold out of vending machines that sat in store fronts. If you’re lucky enough to find one that survived in top shape then you’re looking at a high price tag. After Chamberlain’s rookie, it’s tough to say what the next most valuable basketball card from the 1961 Fleer set is. But Oscar Robertson’s rookie makes as good of a case as any. The “Big O” could do everything on the court and famously became the first NBA player to average a triple-double in 1962. That dominance made him a legend and a collector favorite as a result. His rookie card lists him as a member of the Cincinnati Royals who later became the modern day Sacramento Kings. The 1986 Fleer Michael Jordan rookie card has earned its place as the hobby’s most important modern sports card due to Jordan’s legendary heroics. On a per-game basis, no one averaged more points than Jordan’s 30.12 points per making him the game’s most feared offensive weapons of all-time. Watching Jordan play was really something special as you knew he could do something amazing and never seen before at any given moment. His popularity has skyrocketed the value of his rookie card but those multi-colored borders can prevent some tough wear challenges. Watch out, though, as the extreme popularity of this card also makes it one of the hobby’s most counterfeited. Another oddball card that makes our list is the 1960 Kahn’s Wieners card of Lakers legend Jerry West. These regional issues were distributed primarily in the Cincinnati area so it’s interesting to note that West was only non- Cincinnati Royal to have a card in this set. The hobby only recognizes the 1961 Fleer as his rookie, but this pre-rookie card released a year earlier is just as if not more expensive. Finding them in top condition without staining is tough though, since the cards were distributed inside packages of meat. Another key to the 1961 Fleer’s set is Elgin Baylor’s rookie card. Baylor’s acrobatic moves were something the game had never seen before and paved the way for other exciting performers like Dr. J, Jordan and Bryant. And most people forget, he’s actually number three on the NBA’s all-time points per game leader board after posting a 27.4 ppg career mark. Also, notice the giraffe logo on his card, something that’s been somewhat of a mystery to Lakers fans and collectors for years. It’s an amazing card of one of the Lakers’ most overlooked legends. The final 1961 Fleer card on our list is Jerry West’s rookie card, which features tremendous pop due to its bright yellow and orange coloring. West’s contribution to the Lakers as a player, coach and executive cannot be overstated. His silhouette is even famously used as the NBA logo itself. Collectors love his rookie card and are willing to pay big bucks for high grade copies. Bob Cousy is the second Celtic legend on this list who made his rookie card debut in the 1957 Topps set. Cousy brought creativity and originally to the game, wowing fans with his unpredictable and improvised passing abilities. His rookie card is notoriously difficult to find in top grade due to poor print quality and centering issues. Another regional rarity is the 1950 Scott’s Potato Chips George Mikan basketball card. It features a black and white Al Papas illustration of Mikan against a light blue background. In fact, the image is the same pose used for his 1948 Bowman rookie card. Distributed only in Minneapolis inside potato chip bags you can imagine how rare and difficult it is to find copies of this card in decent shape. Somewhat surprisingly, it wasn’t Jordan’s sticker that was the key to this set even though his card is by far the most desired in the regular 1986 Fleer basketball card set. Instead, Kareem Abdul-Jabbar’s card takes the top price honors. The sticker features a great image of Abdul-Jabbar’s legendary skyhook that was basically unstoppable over the course of his career. The most valuable of all the Fleer Jordan stickers on this list was actually not his first. It’s his 1988 Fleer sticker that tops the list. PSA 10 Gem Mint copies have actually been seen selling for over $20,000 in the past so the estimate above may be a bit low. His is lucky #7 in the 11-player set and collectors will need a tremendous amount of luck to find one in high grade. A regional issue that has grown in popularity in recent times is Michael Jordan’s 1985 Interlake card. These were issued by the Boy Scouts of America through the Interlake Youth Incentive Program in the Chicago area and show Jordan breaking down the defense with his signature tongue-out expression. The card measures in at 5″ by 7″ making it an oversized issue that can be susceptible to wear and tear. Johnny Moore is not a household name among basketball fans but collectors of the 1986 Fleer basketball card set know him all too well. This card is valuable for one simple reason: it is nearly impossible to track down in PSA 10 Gem Mint condition. Otherwise, it would be worth as much as any other common card in the set. Print defects as well as the usual wear and tear on the colored borders make Moore’s card extra difficult to find in high grade. And since this set is arguably the most popular among basketball card collectors, set builders fight over top condition Johnny Moore cards. As a member of the Cincinnati Royals, Oscar Robertson was the biggest local star to be included in this regional set distributed around the Cincinnati market. A young Robertson is shown getting ready to toss a bounce pass while a nice facsimile signature accompanies him. It’s a key to the set along with the cards of fellow Hall of Famers Jerry West and Jack Twyman. One of the rarer basketball sets in the hobby is the 1968 Topps Test issue that was never distributed to the public. Many think they were an attempt by Topps to obtain an NBA license and re-enter the basketball card market. Leading the way at card #1 in the set is none other than Wilt Chamberlain. Each of the card backs in this set also feature small pieces to a larger puzzle of Chamberlain. Bill Russell was also included in the set and is one of seventeen Hall of Famers that appeared in this small set of just twenty-two cards. A nice image of Russell dribbling down low ready to attack the defense dominates the front of the card. This and all other cards in the set usually suffer from poor centering and general wear and tear so finding any of them in top condition is extremely difficult. Fleer offered another 11-player set of stickers the year before but surprisingly, Jordan’s wasn’t the most expensive. That wasn’t the case in 1987. Fleer again included 11 players in the set and this time it was Jordan’s that was the most expensive of the group. A patriotic design of red, white and blue flanks both sides of a great image of a young Jordan with a bright smile on his face. Condition issues are just as tough as before with these stickers making them scarce in high grade. Perhaps the most boring card on this list is merely a checklist. The 1969 Topps basketball set is popular among collectors and being the last card in the set, it’s usually tough to find in nice shape. So, collectors are willing to pay top dollar for the card which displays cards #1-42 on the front and cards #43-99 on the back. Jordan’s 1986 Fleer sticker can also fetch huge prices. A young Jordan is shown driving hard to the basket past New Jersey’s Otis Birdsong. Not surprisingly, the stickers were often peeled off and stuck on any number of surfaces making them basically worthless. And those that survived intact are difficult to find in top quality condition. Jerry West was another one of the superstars included in this rare set and his signature smile really makes this card glow. It’s not the most expensive card within this set but it is definitely one of the keys. Any Jerry West card is likely to be of huge importance to any set and this is no exception. Wilt Chamberlain’s cards are always going to be valuable in any set. But the fact that this was card #1 in the series meant it was at the top of the printing sheet and therefore exposed to more wear than normal. It’s a beautiful card of “The Stilt” that shows him in his warm-up gear and wearing a headband which was common for the era. Since it was never circulated to the public, this set isn’t what you would typically refer to as a “mainstream” issue. But many collectors still consider this Havlicek’s true rookie card since it was his first appearance on a basketball card of any kind. Havlicek goes down as one of the all-time Celtic greats so collectors will fight for any of his cards, let alone one as rare as this. Jim Pollard helped lead the Minneapolis Lakers to five NBA champions during his stint with the team from the late 1940’s through the mid 1950’s. He was famous for his jumping ability and earned the nickname “Kangaroo Kid” along the way. His rookie card came in the infamous 1948 Bowman set on which Pollar stands, arms outstretched atop a blue background. Like all 1948 Bowman cards, print defects and centering are big challenges with his rookie card. Braun was one of the best guards to play professionally in the 1950’s. He played all but one of his thirteen seasons with the Knicks and often led the team in scoring. His 1948 Bowman rookie card is the last card in the iconic set making condition issues even more common. It’s definitely one of the tougher cards in the set to find in top grades so collectors are willing to pay premiums for better copies. Nate “Tiny” Archibald was one of the game’s best guards during the 1970’s and early 1980’s. Known for his speed and quickness, Archibald knew how to get the job done on offense. In fact, he is the only player to ever win both the scoring and assists title in the same year. His 1971 Topps rookie card is a key to the set and features a great shot of the young Archibald atop a bright orange background. Playing for his fourth team in 1981 as a member of the Boston Celtics, Archibald helped lead the way to an NBA Championship. Centering is most often the biggest challenge for this card. Hall of Famer Jack Twyman’s rookie card debut came in Topp’s first basketball card set in 1957. His rookie is just as difficult to find in high grade as any other in this set due to the print quality and centering issues. Twyman is shown kneeling and displaying the basketball in somewhat of an unusual pose for a basketball card. Clyde Lovellette is yet another Hall of Famer to make his rookie debut in the 1957 Topps set. Lovellete knew how to win at basketball, becoming the first player ever to win an NCAA Championship, Olympic gold medal, and NBA Championship. He was instrumental in changing the way centers played the game, often extending his shooting range far beyond what was typically seen in those days. Here is an interesting case where a player who wasn’t particularly a standout has seen his rookie card increase substantially in value. It’s one of those cases in the hobby that has to do more with printing facts than a player’s accolades. Not only was Schnittker’s card a short print, meaning fewer of them were printed and making them more rare in the first place, but his was the last card in the set. That position in the printing sheet and often at the bottom of kids’ stacks of cards bound by rubber bands exposed his card to greater than usual wear and damage. For those reasons primarily, his card is highly sought after by 1957 Topps set builders. The acrobatic Elgin Baylor also made an appearance in the 1968 Topps Test set wearing his legendary Lakers uniform. You can almost feel him getting ready to break down an opposing defense with one of his signature moves by the way he’s positioned on this card. His is another one of the keys to this scarce set and can fetch big dollars at auction. Would this set be complete without the “Big O”? Absolutely not. One of the game’s greatest all-around players to ever lace up a pair of basketball shoes is also one of the several stars in this set. His card really pops as he poses smiling with an energetic look on his face. Both Oscar Robertson collectors and 1968 Topps Test fans will pay good money for one of these in top condition. Mikkelsen was a tenacious defender throughout his career and as a member of the Lakers alongside George Mikan and Jim Pollard, he’d go on to help win four NBA titles in his career. During a three year stretch in his career he led the league in both personal fouls and disqualifications. That speaks to how aggressive he was. His play helped bring the power forward position to prominence as an integral part of the game that stands today. His 1957 Topps card is also one of the short prints in the set and that gives it an extra boost in value. Another key to the 1971 Topps set is Chamberlain’s #70 issue. The card is full of color as Chamberlain is shown on top of a bright pink background wearing his yellow Lakers jersey. It can be tough to find in PSA 10 Gem Mint condition due to centering and print challenges, but if you are lucky enough to have one, they can go for big bucks. Bill Walton was one of the greatest college basketball players to ever play after leading UCLA to back-to-back 30-0 seasons and three Naismith Player of the Year awards. His NBA career was plagued by injuries but he was still able to produce enough to be elected to the NBA Hall of Fame. His 1974 Topps rookie card is instantly recognizable with its blue and pink color scheme along with Walton’s huge hair. Cards like Walton’s rookie don’t get much better in reflecting the styles of the times. Bob Pettit’s 1957 Topps rookie card was actually a double print but collectors will still have a tough time finding them in high grade. Like any card in the set, Pettit’s card can be difficult to find in top condition. A nice image of Pettit putting up a set shot atop a yellow and red background really make the card pop. “Pistol” Pete Maravich was nothing short of a magician on the basketball court. His passes and all around trickery are the stuff of legend. Maravich sits alone as the key to the 1970 Topps set with his oversized rookie card. It’s a great looking card and shows Maravich kneeling with the ball atop a bold green background. Nat Clifton was the third African-American to ever play in the NBA making him one of the key players to help break the color barrier in the sport. He sits at the top of the 1957 set at card #1 which means it can be very tough to find in high grade. The position at the top of printing sheets and usually at the top of kids collection stacks meant more exposure to wear than usual. It’s a highly sought after card by set builders of this popular series. Hall of Famer David Thompson was a standout at North Carolina State and led them to the school’s first ever NCAA championship in 1974. That success spilled over into a very nice ABA and NBA career where he would rack up ABA Rookie of the Year honors in 1976, several All-Star appearances and four NBA championships. His rookie card is the key to the 1976 Topps set and is easily recognizable as one of the most sought after rookie cards of the decade. Some consider the Boston Celtics backcourt that featured Sharman alongside Bob Cousy as one of the best, if not the best backcourts of all-time. Their 1957 Topps cards even look quite a bit alike. He’d go on to appear in eight All-Star games and win four NBA titles with the Celtics. His card features lots of action and nice coloring for a set that could often times appear a bit on the bland side. Although Cowens stood at 6’9″ and was thought to be too small to play the center position, he defied critics and had a very nice career at both that position and power forward. He’d earn 1971 Rookie of the Year honors, the Most Valuable Player award in 1973 and would win two NBA titles along the way. His 1971 Topps rookie card really pops with its bold orange background and green cartoon-like Boston team name at the top. Centering and print defects are common challenges. Ernie Calverley was an All-American at Rhode Island in college but only played three years professionally in the Basketball Association of America. Even though his career as a pro wasn’t as successful as that of other players on this list, he holds a key spot in the hobby as card #1 in the iconic 1948 Bowman set. That position in the set alone would be enough to increase the value of anyone’s card and that’s the main idea here with Calverley. Centering and print defects are common as usual with this set, but his position at the top of the printing sheet made it even more susceptible to wear. Neil Johnston’s 1957 Topps rookie card can come off looking a bit creepy. Johnston spent eight years in the NBA with the Philadelphia Warriors and would win one championship and six All-Star nominations along the way. The Hall of Famer was known for his scoring and rebounding abilities and led the league in each of those categories at least once before knee injuries forced him to retire. His ghostly appearance is made even more prominent by a deep black border, something you don’t see too often on sports cards. Julius “Dr. J” Erving was easily one of the most entertaining basketball players the game has ever seen. Known for his high flying acrobatics and uncanny athletic ability, Erving would awe crowds seemingly on a nightly basis. The 1972 Topps Julius Erving rookie card is the key to the set and one of the most desirable rookie cards in the hobby. That’s understandable when you realize the guy put up over 30,000 points, while snagging over 10,000 rebounds and dishing out over 5,000 assists. His was a legendary career and collectors will pay up for top grade Dr. J. rookie cards. Hall of Famer Rick Barry is another key rookie to collect in the 1971 Topps set. Barry could flat out score and was the only player to ever lead the NCAA, ABA, and NBA in scoring over an entire season. One of the more notable things about Barry was how he shot free throws: underhanded. It must’ve worked though as he finished with a .900 career free throw shooting percentage. His rookie card is full of color and shows him intensely eyeing down the bucket as a member of the ABA New York Nets. The 1973 Topps set doesn’t contain nearly as many valuable cards as other vintage sets but Bob McAdoo’s rookie card is a clear exception. The legendary forward is shown holding the ball high overhead ready to shoot as he stands close to a wall. The card design of the 1973 Topps set isn’t as flamboyant as other Topps sets of the decade but that doesn’t stop collectors from loving this card. It’s a key rookie of the 1970’s but can often suffer from poor centering and print defects. The “Iceman” was one of the game’s greatest offensive threats and went on to win four scoring titles over his career. His 1974-75 Topps rookie card can be found fairly cheaply in lower condition but if you locate a copy in PSA 10 Gem Mint condition it will go for thousands of dollars. Centering is a common challenge. The lone card of the 1975 Topps basketball card set to make our list is the #254 Moses Malone rookie card. Malone is shown going up for the score over an outstretched and desperate defender, a common theme in his career. The card design is rather straightforward and doesn’t feature much color. Instead the large action shot of Malone is clearly the focal point of this important and key rookie card. Adrian Dantley’s 1977 Topps rookie card rounds out our list and can go for thousands of dollars in top grade. The 1977 Rookie of the Year, Dantley went on to post an impressive career that would feature six All-Star appearances and two scoring titles. His is a sharp-looking rookie card with its nice, clean cut design and just the right amount of color. As with most sets of the 1970’s, centering and print defects are common challenges with this card. So, there you have it: the most expensive basketball cards that you’re ever likely to encounter in the vintage hobby. Wilt Chamberlain, Michael Jordan, Kareem Abdul-Jabbar, Oscar Robertson and Jerry West are just several of the basketball greats that reside on this list of cardboard rarities. And their continued popularity and demand prove that basketball cards still do hold great value. That is a fact not likely to end any time soon. Only a finite number of them still exist and as likely as it is that basketball will remain a very popular sport, collectors will do anything to get their hands on them.